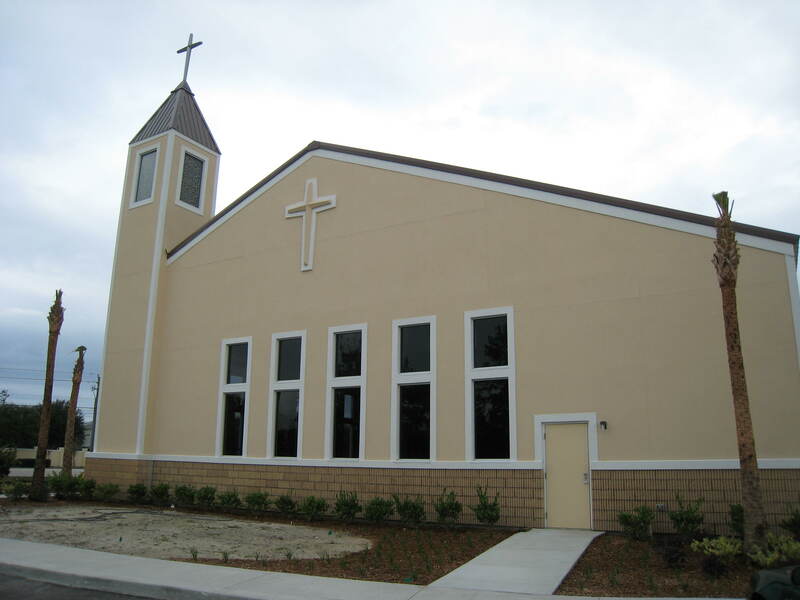 After almost a year of joy and jubilation, headache and heartache, Our Savior’s Lutheran Church in Port Orange, FL is more or less finished with their building project. It has been a long and adventurous road to say the least, but now the fruits of their labors can be seen. This building project is important to Christ the King, Palm Coast for several reasons. First, we certainly rejoice with our brothers and sisters who are able to achieve a goal and a dream of better worship, better service to school children, and better outreach to the community through a new building. Second, we certainly can learn from all the experience of this sister congregation to the south as we move forward with our construction. Finally, this church is near and dear to our hearts since it is not only our sister church, but also our mother church. Several of our families had been attending this church before Christ the King was around. This was also the church responsible for helping to get Christ the King started. For all these reasons, we share in their joy. This new construction is an addition to the existing building that had served the congregation for years. The previous church and offices has become the permanent school. With the addition of this new church wing then, they have about 11,000 s.f. of usable space. The entrance to the worship space is certainly memorable. 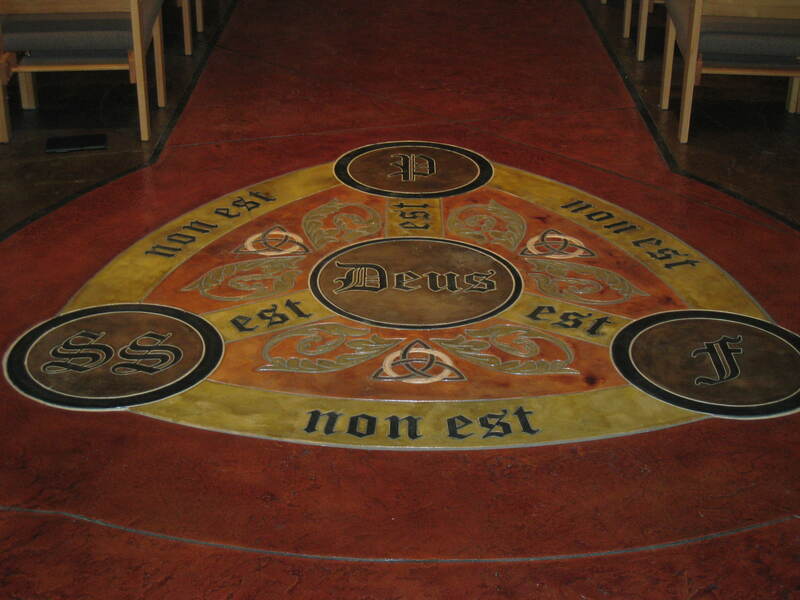 Carved and stained into the concrete floor is a familiar Christian symbol, the shield of the Trinity. The three circles on the outside have letters that stand for Pater, Filius, Spiritus Sanctus–Latin for Father, Son, Holy Spirit. Non est means is not, est means is, Deus means God. So the symbol simply reminds that there are three separate persons, Father, Son, and Holy Spirit, who are one God. The finishing touches within the building certainly add a wonderful touch to the worship space. The textured and stained concrete continues throughout the worship space. This modern concrete look is nicely accented by the oak pew chairs and the oak decking on the different levels of the chancel. 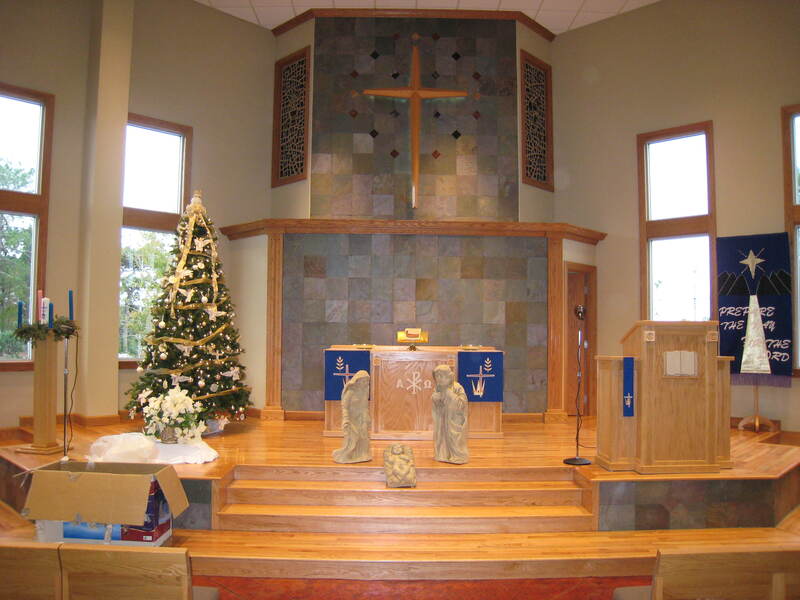 The backdrop to the altar is a dark tiling, another modern and earth-tone material. The backlit Bethlehem cross draws focus as the center for both praise and proclamation. 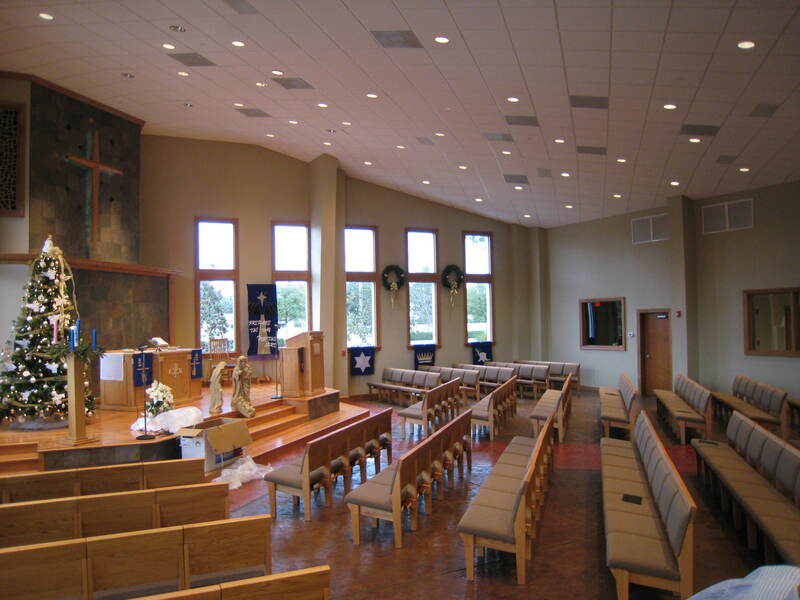 The seating within the sanctuary is not the traditional front to back, but rather is in a fan or shell shape. This seating allows all worshipers to be close to both Word and Sacraments. It enables the worshipers to participate more actively. It reminds the worshipers of the centrality of the gospel in our worship and our lives. It gives the worshipers a sense of unity and fellowship as others are both close by and in plain sight. Christ the King will also employ this same kind of seating arrangement. The fervent prayer of the Christ the King family resounds clearly before the throne of Christ our heavenly King: That this new building in Port Orange might bring rich blessings; That it enhances their worship of the triune God; That it improves the education of their children; That it is a tool to reach more in the city of Port Orange; and finally, That all those blessings might come with the completion of our new building, too. Posted on December 11, 2009, in Church and tagged Building Project, Church, Church News. Bookmark the permalink. Leave a comment.